The 1893 New York state election was held on November 7, 1893, to elect the Secretary of State, the State Comptroller, the Attorney General, the State Treasurer, the State Engineer and a judge of the New York Court of Appeals, as well as all members of the New York State Assembly and the New York State Senate, and delegates to the New York State Constitutional Convention of 1894. The People's state convention met on August 18 and 19 at Sylvan Beach, New York. I. E. Dean was Permanent Chairman. James Wright was nominated for Secretary of State on the first ballot (vote: Wright 31, John Taft 28). De Myre S. Fero, of Glens Falls, was nominated for Comptroller on the first ballot (vote: Fero 47, E. P. Nevins 5). Frank H. Purdy, of Bluff Point, was nominated for Treasurer by acclamation. Thaddeus B. Wakeman, of New York City, was nominated for Attorney General; Lawrence J. McParlin for the Court of Appeals; and John A. Webster, of New York City, for State Engineer. The Prohibition state convention met on August 30 at Elmira, New York. Joseph A. Bogardus was Chairman. 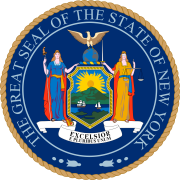 They nominated Joseph A. Bogardus, of New York City, for Secretary of State; George Chester, of Buffalo, for Comptroller; William R. Hunt of Honeoye Falls, for Treasurer; Edwin C. English, of Corning, for Attorney General; Silas W. Mason for the Court of Appeals; and Chester Belding of Middletown, for State Engineer. The Democratic state convention met on October 5 and 6 at Saratoga, New York. Daniel N. Lockwood presided. Cord Meyer, Jr., for Secretary of State Comptroller Frank Campbell, Attorney General Simon W. Rosendale, Hugh Duffy for Treasurer, and State Engineer Martin Schenck, were nominated by acclamation. The incumbent Isaac H. Maynard was nominated for the Court of Appeals after Robert Weidenmann, of Rockland County, spoke out loud against this nomination, and asked for a roll call. Weidenmann however was the only one who voted against Maynard's nomination. The ticket had been published already before the convention met, showing a strong party machine. The electorate however had still in mind the electoral fraud of the Dutchess County senatorial election in 1891 which went through the courts and involved the Democratic state officers; Judge Maynards subtraction of the letter containing the corrected statement, sent by the Dutchess County Clerk to Albany, which action showed him as "cheap political trickster" and made him a "disgrace to the bench"; and Treasurer Danforth's and Ex-Treasurer Fitzgerald's connection with the bankrupt Madison Square Bank in which Danforth had deposited State funds and which had given Danforth a "loan" of about seven years Treasurer's salary but closed its doors in August 1893. Dragged down by Judge Maynard, the Democratic ticket was defeated, ending a ten-year supremacy which began with the election of Grover Cleveland in 1884. The Republican ticket was elected, beginning a Republican era of thirteen years in New York state politics. The incumbents Campbell, Rosendale, Schenck and Maynard were defeated. ^ Maynard had been appointed in 1892 to fill the vacancy caused by the appointment of Robert Earl as Chief Judge following the death of William C. Ruger, and had been re-appointed in 1893 to fill the vacancy caused by the election of Charles Andrews as Chief Judge.